U.S. Navy Admiral John C. Aquilino, Bridgton Academy Class of 1980, was named Commander of the U.S. Navy’s Pacific Fleet in a ceremony on May 17 in a ceremony on Joint Base Pearl Harbor-Hickam, Hawaii. Most recently commander of both the Navy’s 5th Fleet and Naval Forces Central Command, Aquilino takes charge of a fleet stretching nearly 100 million square miles, nearly half of the Earth’s surface. The U.S. Pacific Fleet consists of about 200 ships and submarines, nearly 1,200 aircraft and more than 130,000 sailors and civilians. 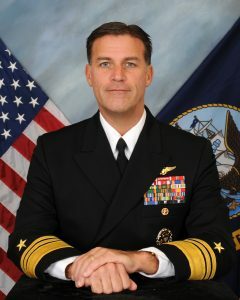 Aquilino graduated from the Navy Fighter Weapons School (Top Gun), the Joint Forces Staff College and completed Harvard Kennedy School’s Executive Education Program in National and International Security. He has served in numerous fighter squadrons flying the F-14 A/B Tomcat and the F-18 C/E/F Hornet. His fleet assignments include the Ghost Riders of Fighter Squadron (VF) 142 and the Black Aces of VF-41. He commanded the World Famous Red Rippers of VF-11, Carrier Air Wing 2 and Carrier Strike Group (CSG) 2. He has made several extended deployments in support of Operation Deny Flight, Deliberate Force, Southern Watch, Noble Eagle, Enduring Freedom and Iraqi Freedom. A resident of Sylvester Hall and member of Bridgton Academy’s hockey team during his time in North Bridgton, Aquilino is a native of Huntington, New York. He matriculated to the United States Naval Academy following his year at Bridgton Academy. He was inducted into the Bridgton Academy Hall of Fame in 2011.